This last week I had to take someone to Otavalo, so I took advantage of the trip and drove to a little secluded and out-of-the-way town called Oyacachi. I had never been there before, but I heard that they have some nice hot springs for relaxation and that the place is very small and special. The town is tucked behind the Cayambe mountain on the eastern slope of the Andes and it takes about two hours drive from the town of Cayambe. The day was very clear and the lack of clouds in the sky gave us a perfect view from the paramo of the colossal Cayambe mountain as we drove towards our destination. The town of Oyacachi was soon visible at the distance and it looked very small. Upon our arrival we headed to the hot springs and spent a couple of hours relaxing by ourselves in very salty-and-hot mineral waters. This was very relaxing! We found some very simple and nice cabañas outside of town and spent the night by a fireplace talking about birds to some local people. The morning arrived and I was woken up by a Rufous Antpitta that called at my window. This was followed by a couple of trucks and motorcycles that drove past the cabañas from the town to their small farms to milk the cows. We got up and followed the dirt road downhill heading towards the east . The road went past some ruins that had been abandoned by the town people some 100 years ago and it followed the river gorge for 10 km on its way down to the Amazon. We were quickly surprised by the Grey-breasted Mountain Toucan that flew across the road and landed 50 meters in front of us while it waited for his partner to catch up. I managed to get a couple of nice shots and soon he was off to the mountains to disappear in the moss. This great bird is classified as Near Threaten by the IUCN Red List due to population decrease owing from habitat loss. And that is what we saw, this small town with only 500 people survive from farming and cutting wood; they do make some amazing wood craft. It was very sad to see such rich vegetation being destroyed by the action of humans merely surviving. Oh well, I guess we don’t have much to worry about since today is the end of the world on May 21st of 2011. Renato, why would you think the world was ending yesterday because of a bunch of religious fanatics, and not next year as predicted by the Mayans? The hot springs sound delightful, that bird is beautiful, and I can only imagine how long it took to drive around to the next pass to get back to Quito! I hope Paola took some dramamine! This is terrific, Renato. 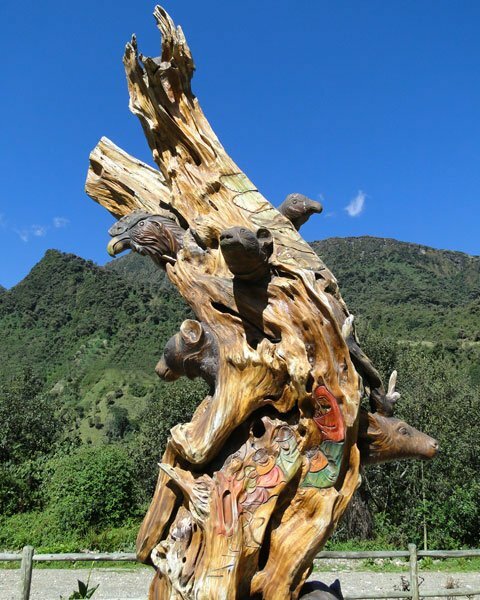 Of course, the Mountain Toucan is supremely colorful, but that terrific carved tree really made my day. Look at this bird. Just look at it! And they had to name it “Grey-breasted”. The end of the world did not come! Viva! Well, not so soon. The other side of the coin is that we must continue to watch our world die slowly, day-by-day. Our supreme race is so well adapteed to harvest all the resources, from high tech companies like BP to the simplest, uneducated man that can buy a chainsaw. Today our government took an amazing step to controlling the destruction of our forest in the Choco region. The president ordered to bomb 67 very large Case Backhoe machines. These digging monsters were spread inside the forest digging small lakes to dig for gold. It is clear to all that these half a million dollar machines could not be afforded by our simple and poor farmers that live in the jungle. This forest is very close to Colombia so I assume that financing for these machines came from illegal money. The question is how can we stop our race from growing beyond the limits of the bounty of earth’s resources? Will the people of the jungle be given and economic viable, and sustainable job to feed their families? Will the destruction of the forest continue? @ Renato-those are VERY BIG questions! We don’t think there are easy answers. We live in a country where so many rely on the government to just give them money to do nothing and that is definitely not the answer. And I was so close to there when I was in Ecuador way back in the day. How I wish I knew you back then. Wonderful post Renato, very beautiful bird, very powerful questions. Thanks Clare and Clare from Australia. Hope to have you here some day! Kentucky: First in Crane Hunting?